The meaning of ”O you who believe”: Some of the pious predecessors said that if you hear the statement of Allaah ‘’O you who believe’‘, then listen attentively because it is either something good you are being commanded or something forbidden you are being prohibited from. And regarding the statement ‘’Ward off from yourselves and your families a Fire (Hell)”; This cannot be achieved except by fulfilling the commandments of Allaah and keeping away from what He has forbidden. This is what the statement ‘’Ward off from yourselves’’ means-by fulfilling the rights of Shahaadah ‘None has the right to be worshipped except Allaah’’; by worshipping Allaah [alone], acquainting yourself with Tawheed and free the Shahaadah from all that either negates it or that which negates the obligations it necessitates. [Likewise], free the Shahaadah from innovations in the religion which are a belittlement of it and the sins that diminishes its worth. Likewise, [the statement Muhammad is the Messenger of Allaah’ has rights], and that is to fulfil what the Messenger [sallal-laahu-alayhi-wasallam] commanded and keep away from everything he has forbidden, and that your worship of your Creator is carried out in accordance with what the Messenger [sallal-laahu-alayhi-wsallam] legislated. And also regarding the statement, ‘’Ward off from yourselves and your families a Fire (Hell)’’: It is well known that children are the most important part of the family, therefore you must take up a shield of protection against the fire to protect your children and those under your care. And what is this protection? It is the advice and guidance you give them about that which will benefit them- teaching them what is beneficial and correct by way of which Eemaan is nurtured in the hearts and by way of which they will come to know the rights of their Creator and the rights of their parents. This is the meaning of ‘’Ward off yourselves and your families a Fire [hell]’’- by advising, guiding, teaching and distancing them from everything that will hold them back [from goodness, uprightness etc.]. We said that children are the most important part of the family, so they must be taught what benefits them and are distanced from evil companions. Teaching them necessitates that which the Book and the Sunnah necessitates in their religious affairs, so that they are nurtured upon a sound, beneficial and good nurturing. And we do not say that it is prohibited to study the beneficial worldly sciences because the religion of Islaam does not prohibit it, such as the knowledge of medicine, economics, business and its likes. However, these affairs come after rectification of the creed and after being [acquainted with] the knowledge of Tawheed. This is what is specified as an obligation. And protecting the family [necessitates] that you distance your children from evil companions- those who have no goodness in them, such as the atheists or those Bedouins who are distanced from their religion. Therefore, you must warn your children about mixing with them and you must strive to [make sure that] they do not mix with them. If your child mixes with them, their evil practices will affect him. Even if your child is sensible, he will adopt some of their manners and deeds due to those evil companions. When a healthy she camel intermingles with a camel afflicted with scabies, it will be afflicted with scabies; or when someone intermingles a lot with a camel afflicted with scabies, he will become afflicted with scabies and his scabies will be transferred to the group and they all become afflicted. You say, ‘’Indeed, my child graduated from such and such university and he has a master’s degree or what they call a PHD, and he studied in America or in London or in such university; and you think that with these [qualifications] he has become a mountain amongst the mountains of the earth’’; but as long as he is unaware of the rights of his Lord, unaware of your rights and the affairs of his religion, then by Allaah he is a mirage and there is neither goodness in him nor in his knowledge [of the worldly sciences]. To be ignorant [of these worldly science] would be better for him because they led him to reject his religion, country and society. The situation of [this person who abandoned his religion] is that of evil and his manners have been corrupted. Therefore, it is obligatory that you do not become lackadaisical concerning the affairs of your children as long as they are young. Teach them what is beneficial and nurture them upon good. Therefore, if the teacher strives together with the households and the fathers, the child will be given a good and upright upbringing. 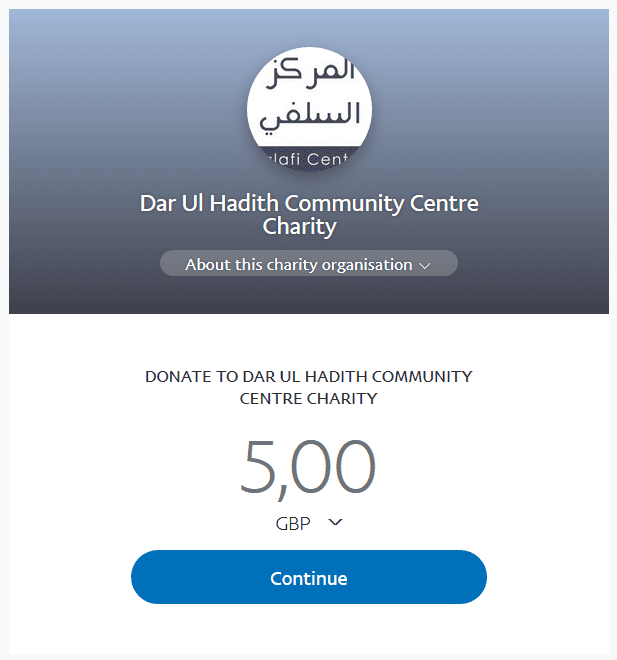 He will benefit his country and government, and Allaah will benefit Islaam and the Muslims through him. However, if his teacher is one of the corrupters, the enemies of Allaah, His Messenger, the religion of Islaam and the Muslim lands, [the student] will follow his footsteps because a student treads upon the fundamental principles of the teacher. 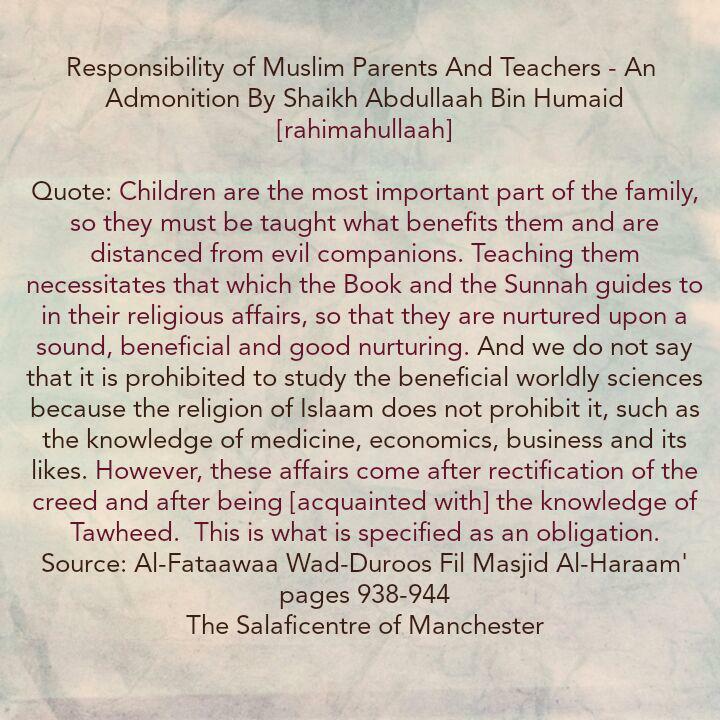 Alas, how can we be pleased with sending our young children to a faculty in America or to such and such country, and he [the parent] says: ‘’My child has gone to study’’, [whilst he has gone] to study disbelief, hearsay, deviation, how to turn away from his family, his country and religion!! They will teach him this, just as Zimmer [The Catholic philosopher and theologian] advocated. Therefore, your children are a trust and when you neglect them, then indeed you have betrayed them. It is obligated on every one of us to fear Allaah with regards to the [affair] of his children and those under his care. The days go past and the end of a [person’s] lifespan draws closer, and a person does not know when his life span will suddenly come to [an end]. [A person] must strive to teach his children beneficial knowledge, nurtures them upon goodness and obedience to [Allaah and His Messenger]. And Allaah knows best, and may the peace and blessings of Allaah be upon Muhammad [sallal-laahu-alayhi-wasallam], His family and companions.